Friday was ok, with me and Maja summarizing the conference and writing down some of the conclusions from it. We managed to get to the Red Fort in Old Delhi (a silver medal from Hillman wonders) and had a close-to-death experience in the process. The taxi driver tricked us into believing that one had to go by bicycle rickshaw the last bit to the entrance (totally untrue - but it would give him a cut from the rickshaw fee). A couple of minutes later we found ourselves sitting on this old bicycle thingie, with Max in between us, and buses and trucks passing on both sides! It was too late to jump off, so all we could do was to sit tight and pray. Luckily (and not too surprisingly) we survived, and in the end the lying taxi driver lost out since we of course didn't get back to his cab as agreed. After visiting the Red Fort we spent quite some time in the Jama Masjid (which one can only do on Fridays! ), which in my view felt more exciting than the Red Fort. Nothing gets close to Saturday though, when we went to Agra and Taj Mahal. It is quite impossible to describe the feeling of the long walk from when you get the first glimpse of it, until you arrive and can touch it. The details in the marble... the grandness... 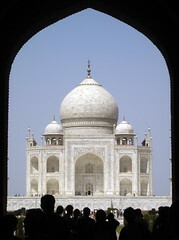 It is often said that a great lot of authors have failed to describe Taj Mahal's beauty, so I won't even give it a try. I sincerely recommend everyone that goes even remotely close of Agra (200 km south of Delhi) to visit, though.